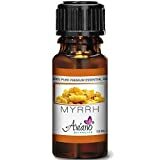 10ml of our 100% Pure & Natural Myrrh Essential Oil from Saudi Arabia, which is known for the best Myrrh essential oil in the world. It comes with a Euro-dropper so you can easily use a few drops at a time. That is all that is needed for this very potent essential oil by Aviano Botanicals.